Back in May I attended the first event of Shadowvale, a new high fantasy boffer larp using the Accelerant system. I joined this game as a player, making it only my second PC role ever! The Shadowvale is a mist-shrouded, spooky forest on world’s northern continent. At its heart is Wystia Castle, once the seat of power for the long-vanished kingdom of Wystia. The malevolent mists have kept adventurers away from Shadowvale and Wystia Castle for over five hundred years. Now, for some unknown reason, the mists are beginning to clear. Envoys from different nations and fortune seekers from all over the world have descended on Shadowvale — including you. The primary plot writers and game owners are Sue Brassard and her husband Eric Von Riegers, who I mostly know from their time staffing and NPCing Cottington Woods. The staff also includes other Cottington staffers: Matt Mitchell, Holly Bianchi, and Lisa Sants among them. There is also former Cottington player, Madrigal 3 staffer, and all-around badass JJ McGill. Basically what I am saying is I love and trust all the staff, and that was in large part my motivation for playing! Starting with the final events of Cottington, Holly whispered sweet nothings in my ear of this game Sue was planning which was inspired by fantasy works I loved, like the Elder Scrolls. I also worked extensively with Lisa when I was NPCing Cottington to make the player of the Fen Witch regret his life and his choices, and realize I wanted to be on the receiving end of that kind of deeply angsty personal plot. So, the first thing to know about my character Melusina is that she started life as a character concept for Crossover, another Accelerant game. I had planned her originally as the fae Melesarla Moon-shriven, a Faithful of the Moon with a history as a disgraced assassin. Eventually I decided that, given when Crossover started, I didn’t have the bandwidth to play. I’m kind of glad I made that decision — it is a tremendously popular game, with a waitlist for every event, and I don’t have the patience for that kind of uncertainty. But Shadowvale looked like the sort of setting that could accommodate the same general character concept. I made changes to Melesarla to turn her into Melusina, but if you still see traces of a Crossover FotM, that is why! Character creation in SV is a four-step process, whereby you choose a race, a culture, a class, and optionally a vocation. Race. Your racial choices are human, Ashen, or Faeborn. The Ashen are basically magicless humans, and the Faeborn are similar to elves, coming in three varieties: Shadowborn, Seaborn, and Forestborn. The Faeborn have costuming requirements that involve elf ears and variously colored hair or eyes. Loving elves as much as I do, and given the history of this character concept, I of course wanted to play a Faeborn. Shadowborn — who evoked the Dunmer in the Elder Scrolls, Warcraft night elves, or Forgotten Realms drow — were especially appealing, and I could see how to make that work with my character concept. That was the easy choice. Next, culture. This has to do with the part of the game world that you are from. As I mentioned, there are two continents. The southern continent is dominated by the Samaran Empire, which, as far as historical analogues goes, seems to take inspiration from both the Roman Empire, as well as Byzantine and Arab cultures. Everyone else is on the northern continent, and your options are: Solenim, which is a very Latin-inspired place, known for its sages and universities; Devon and Brenland, the two kingdoms that used to compose Wystia, and are sort of British Isles-y (one more traditional than the other; ask me if I remember the difference! ); Avaria, a land of merchant city-states, very Renaissance Italian in its feel; the Free Isles, where pirates come from; and Svordland, which bears a clear Viking/Nordic influence. There were also the Old Forests, the home of the Forestborn, and the Floating Villages, a series of boat-cities, attached to large cities around the coasts, which are often peopled by Seaborn. Shadowborn could be from just about anywhere, so I let my choice of vocation (more on that in a bit) determine my culture: Avaria. After reading the Avarian culture packet, I made a comment to Sue that it reminded me of Camorr, from Scott Lynch’s Gentleman Bastards books. She replied with “Avaria wouldn’t exist if it weren’t for those books.” So, uh, I chose well. In particular, Melusina is from the city-state of Devara, which is again relevant to her vocation. The culture you choose also informs your choice of names; Avarians apparently have long, Italian-sounding names. Here is where Melesarla — which never sounded right to my ears — became Melusina, which sounds more… well, mellifluous. I added on “Ombras Sarezzo.” “Ombras” reminds me of the Latin word for “shadow”, and Sarezzo is… well, “Sarethi” is a Dunmer name I use a lot when I play a dark elf in Elder Scrolls games; it was kind of a variation on that. Class. There are five classes, which break down further into a large choice of headers. At the top level, you can be a warrior, rogue, sage, witch, or occultist. To be honest, I didn’t look at much but rogue. Given the backstory I envisioned for this character, I zeroed in on that class — in particular the assassin header. I also considered the Fae Hunter specialization, but dropped it when I realized that “fae” is not the same as “Faeborn” (something I had to explain many times over the weekend — the game materials don’t really delve into it, and I only know because Sue corrected me on its usage when I submitted my character history). Vocation. Here is where you can choose things like a craft, a profession, or a faith. The faiths are tied to the culture you choose, which is why I ended up choosing Avaria — because the Lady of Mysteries, the Avarian goddess of night, mystery, and luck (good and ill), was pretty much exactly what I needed. If we’re continuing to compare Avaria to Camorr, the Lady of Mysteries is kind of equivalent to the Nameless Thirteenth god of that pantheon. The header associated with it is called Veiled Priest. In addition to the trait “Faithful of the Lady of Mysteries,” it gains you access to a really nice once-per-twilight free Avoid, and the uber-powerful No Effect to Shadow. I decided that in a game called Shadowvale, that would be the best thing ever. So that’s me: Melusina Ombras Sarezzo: Avarian Shadowborn Veiled Priest and assassin. What does she look like? Shadowvale takes place at Camp Frank A. Day in East Brookfield, MA — the site of Cottington Woods as well as Mirror Mirror. As far as camps go, it’s one of the nicer ones — the cabins are a little shabby, and the water tastes like sulfur, but there’s electricity in every space, and the bathrooms are generally clean. The women’s room in the player cabin area has a nice series of mirrors for checking out your costuming, too 😉 The new owners seem to actually understand larpers, too, and are fairly tolerant of our eccentricities. Shadowvale used the space differently than Cottington, and I think it was a good decision. The largest mod space at Frank A. Day is the rec center, usually referred to as “the hangar” due to its size and appearance. It is closer to the road, meaning it’s a bit of trek to get to it from the main camp. My husband jokingly referred to it as “the building that makes the dawn come,” due to how long he had spent in there as a Cottington PC. Shadowvale does use this a mod space, too, but sparingly. 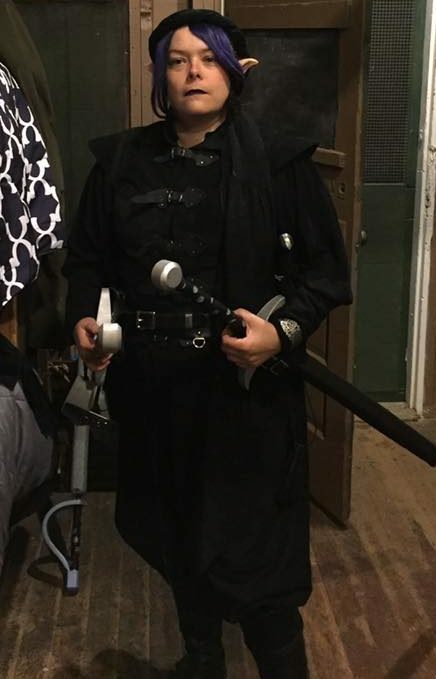 We only had one mod that took place there, the Saturday night “capstone” of visiting the audience chamber of Wystia Castle. Instead of the hangar, staff used McKnight Hall — the camp’s dining hall, which Cottington used as a tavern — as the primary mod space. Not having McKnight Hall as a tavern has some positives and negatives. A negative is that you can only get to the refrigerators/kitchen during meal times, which made storing stuff there unattractive. (Most people I know opted to keep their food in coolers at their cabin instead). I’m not sure if this is connected at all to why we didn’t have food service at the game. Two of the cabins in the Juniors area were set aside as tavern space, but they were too small for the entire game to gather at once. I feel like not having a large, central indoor place for people to gather actually turned out to be a net positive. This turned the Juniors area of the camp, which is where PC cabins are, into the primary gathering space, rather than just a place PCs go to sleep. A couple groups (mine included) brought pop-up tents to put up outside, and these quickly became small group gathering spaces — especially when we offered coffee. If you can imagine PCs wandering between a bunch of small groups, chatting, eating and drinking, and moving on — and NPCs coming there to hook mods — then you can imagine the homely feeling this engendered. I really felt like this, more than anything, contributed to our “town” feeling like the encampment it was supposed to be. Also, this opened up the possibility of having field fights in Juniors field, which is something I didn’t see much at Cottington. Obviously, as a player I didn’t have a good grasp of logistics. From my perspective, everything ran fairly smoothly. The only noticeable lack was somewhat out of the staff’s control: NPC numbers. Apparently strep had been going around the local larp community, knocking out a lot of people who had committed to NPC. As JJ recently wrote, one of the most commonly-heard phrases in Monster Camp was, “What’s the absolute minimum you need in order to run that mod?” I know, for example, the mod that was intended to be my welcome mod was postponed until later in the evening, because they literally couldn’t spare the one NPC to run it. I also noted that we started about an hour late on Friday night. While not great, this was completely understandable, given the lack of NPCs — and isn’t that bad, by all accounts I’ve heard of first event start times. In a teaser that was sent out before game, we were informed that our parties that had been traveling through the Shadowvale had been overtaken by mist and gotten lost. Mechanically, this meant we would be starting in separate welcome mods. Also before the first game we filled out a questionnaire concerning which paths we would like to follow. The different paths, with names like “Path of Magic” and “Path of the Imperial”, were mostly flavor, meant to gauge what plots you wanted to be involved in. I don’t recall my response, but I believe I rated the Path of the Rogue, Magic, and Faith highly. Holly, my “in” on staff, informed me later that these were what were used to determine what welcome mod you got. Sorta. NPC numbers were again a concern. The Path of the Rogue welcome mod actually had to run later that night, because, as I was told, they literally could not spare the single NPC it required. So instead I ended up on (I think) the Path of Magic welcome mod. I found myself on that mod with two other people from my team, as well as two players I was unconnected to. We were given an ambient Stun effect, to represent the fact that we had passed out or fallen asleep wandering through the mists, and a short time later, a cure for that. We found ourselves in a pool of light, somewhere in the forest. After puzzling through a challenge involving jumpy stones, an enigmatic fae(?) called the Watcher, and a confused-seeming woman named Cora, we found our way back to a way gate — a garden arch lit with purple lights and draped with black cloth. We found the rest of the players milling about there, with news that the encampment we all had been seeking was just ahead. With this, we made our way to our cabins and began meeting our fellow adventurers. As far as introductions to the game go, I think this was a fine one. Adina of Fair Escape has opined before that she doesn’t like “cold” intros, where the staff just gathers everyone in a common space and says “game on.” This was much better in this regard. If I had any quibbling complaints about this opening, it’s that I could have used a bit more time to get into character before we were thrown into solving a physical challenge. Oh, and I did finally get my intro mod — just later in the evening. The one other Path of the Rogue player in game (!) is my team member Kim; together, we had to pick locks and disarm traps to free Finn (also Totally Not a Rogue) who was trapped by bandits. (These were the first, of many locks I would open this weekend — Sue and Lisa sure do love their roguery). From there he led us on a series of adventures spanning the weekend, to the purpose of getting his stolen stuff back. The main plot for the weekend involved the opening of Wystia Castle. Though the mists had receded from around it, still mistwraiths haunted the area, so it was important that we tread carefully. As a result, we would fight mistwraiths again and again that weekend. We learned, too, that humans could be taken by the mists, and what that looked like. Our explorations started with a visit from the Sages Guild on Saturday morning, talking about what we could expect and what we should pay attention to in exploring the Castle. Many of us also learned the Surveying skill, which would allow us to do the Surveying mechanic. With this mechanic, we were allowed to read certain types of tags found in labeled envelopes throughout the ruins that described a scene; we were encouraged to then describe or draw the scene that we surveyed in our own way. Throughout Saturday, we explored different parts of the outer castle — the stables, the blacksmith’s forge, the barracks — and discovered different bits of information and treasure there. This exploration culminated on Saturday night with the opening of the audience chamber of Wystia Castle. We started down the road to the hangar, dogged by mistwraiths the whole way. Outside of the mod building, some of the PCs had the idea to stop and have a sort of… dedication, or oath-taking, as a way of appeasing the spirits resting within. The three priests of the dead among our number — one of whom my husband Matt plays, Silent Priest Torian Eventide — said a few words (improvised and yet quite lovely), and then as a group we knelt and swore that we came with no malice in our hearts. When we were done with our dedication, the door to the castle rolled upon under an unseen hand, and a mist-shrouded spirit gestured us in. What did we find within? A huge space, crawling with mist (courtesy of a fog machine), the lights dim. A royal court in their finery, acting out scenes from five hundred years past, mist lying heavy on their shoulders. Warnings of the court’s demise scattered about the space, in locked boxes; the court blithely ignoring these warnings, when we brought them to their attention. It was probably the greatest of several spooky, atmospheric scenes the staff laid out for us over the weekend. And, as I said in my PEL, “spooky” and “atmospheric” are adjectives this game did really, really well. I also want to say a word about a plot tool/game mechanic that was used in a number of mods — regrettably none that I was involved with! One of the sages (played by Matt Mitchell) invited us to engage in some “alternative revisionist meta-history” to explore the past of the world, revisit some myths and legends, and determine the veracity of past events. This turned out to be a spin on the game Microscope, a collaborative storytelling game. I’ve never heard of any game using this mechanic, and I thought it was a great way of getting players involved in building the history of the world. I did many, many other things this game — explored a creepy mortuary in the sewers and fought an animated trash monster, helped one of the Wardens of the Shadowvale to piece back a ward stone to keep away mistwraiths, and attempted to infiltrate the Brennish delegation to the Shadowvale, to name just a few. But to write out everything I did would require way more space than I have in this post, and hey, that’s why I wrote a PEL. Like most Accelerant games, Shadowvale has customized the core rules to suit its own needs. One of the most interesting additions was “Minor” traits i.e. “Root by Minor Blood.” This is different than a Short, in that the effect can be purged in ten seconds without a rest. I understand SV wasn’t the first game to do this (it might have been 7V? ), but it worked well for their purposes. Shadowvale also has Twilight skills, which are skills that refresh at 6am and 6pm every day. Functionally this divides the game into four periods: Friday evening, Saturday daytime, Saturday evening, and Sunday daytime. Unsurprising, considering the staff, this was inherited from Cottington Woods. I was hesitant about this at first, but it turns out that having a skill that refreshes less frequently than per encounter but more than per event is really handy! SV also borrows the use of Comatose from Cottington Woods, which allows you to choose to go Comatose when you would otherwise bleed out from called damage. From there you would would need a Cure Comatose, or 10 points of healing, to return to consciousness. This does feel a bit clunky to me, but I admit it would avoid many deaths of the “was wearing black and bled out in the woods” sort. Given my costuming for this game, I am in favor! Shadowvale’s attribute system is different than I’ve seen, as well. You have Vitality, of course, which determines how many hits you can take before you fall. Then your abilities are mostly powered by the Resilience and Endurance stats. The former tends to be used for defenses and passive effects, while the latter tends to be used for attacks, healing, and other active effects. You also have Determination, which can be used in place of either, but costs more to buy initially, similar to how Void works in some Accelerant games. Unlike Void, however, Determination still refreshes with rest/per encounter. All that said, I used very few of my skills during this event. Perhaps this was because it was my first time playing a melee skirmisher type character, and I was still getting my footing with that whole “sneaking around behind enemies in the darkness” thing. I had a free per Twilight Avoid as well as an Avoid that cost me 2R, and I don’t think I used either more than once the whole game. Even when Sue’s boss monster in the final fight of the weekend laid into me with a 10 damage! It could also be a consequence of the fact that this felt like a combat-light game — at least compared to 5G, which sometimes drives us into the ground with combat! I’m not sure if this is intentional, or a consequence of how few NPCs there were. Folks, I had an amazing time, and I know a lot of other people did, too. I would not be surprised if this game is the sleeper hit of the season. It combines great storytelling from experienced GMs, a world we’re invited to participate in building, and a novel (to me) social dynamic. My only regret is that there was only one spring game. Now I have to wait until September to get my fix! The two big things I was going to say are already here! I will have to think of other things to say. Man, when is one of the games I play going to do an opening like that. I had really high hopes for Fifth Gate, then Crossover and now Shadowvale did it. The fae court modules sounds really cool. I know the fog bothers people sometime, but I wish it was used more often. The tent encampment sounds really cool, and like it’s a much nicer way to hang out than in the tavern, though I do wonder about how it will work out in really bad weather. I hope you do come out to NPC! They certainly could use more hands, and it seems like they treat their NPCs right. There was definitely a lot of RP stuff to be done by NPCs, too, not just crunching. I’m expecting that in bad weather, people will migrate into cabins? I mean, since there’s no big tavern, it’s either PC cabins or the two cabins set aside for shared space. I don’t think the feel of the game or the hooking of mods will suffer, but I guess we’ll see.